Modifies the standard Workflow Voting dialog, by adding an AdHoc button. This allows the assignee of an Activity to create some adHoc activities, to ask for help, before deciding how to vote on the currently assigned Activity. The added AdHoc Activities are placed into a separate Workflow Process. The new workflow sends emails to the selected new Assignees, and after their work is done, the workflow returns to the originator. After reading the comments from the adHoc assignees, the original assignees can then open the original Activity and complete it. 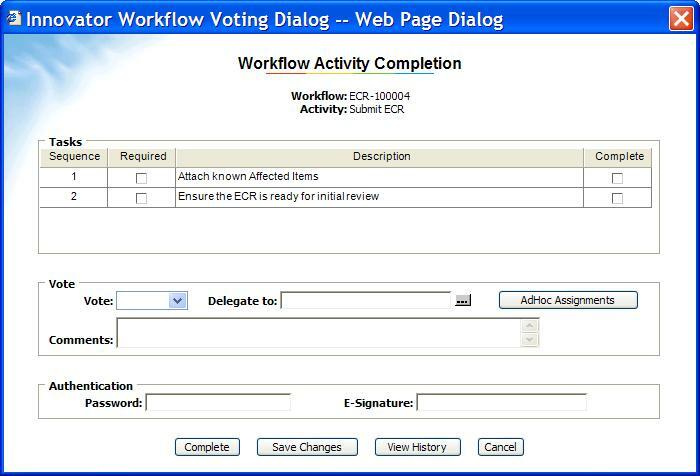 Future ideas: Option on the dialog to put the adHoc activities into the same Workflow process so that the AdHoc votes are recorded and archived along with the original Workflow activities.